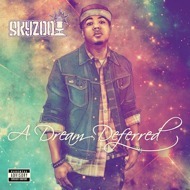 The follow up to Skyzoo's acclaimed debut LP "The Salvation", 2012's "A Dream Deferred" is finally available on vinyl. The sophomore album by the Brooklyn wordsmith features the singles "Jansport Strings", "Range Rover Rhythm", and "Spike Lee Was My Hero" (featuring Talib Kweli). The fan favorited project includes guest spots from Jill Scott, Freeway, Talib Kweli, Raheem Devaughn and more, and boasts production by !llmind, Jahlil Beats, 9th Wonder, Black Milk, Tall Black Guy and a host of others.